The ingredients for this nut roast came from various places. Whilst going through my kitchen cupboards I found various things that get pushed to the back. Amongst various things that I will share with you in the next few days as I am determined to use them up, one was potato flour. I don't even remember picking up potato flour; and the other was a packet of Brazil nuts. The beetroot came from my mothers home. I had some wholemeal brown bread going stale, it was going to go to the wood pigeons in the garden, but I decided not to share it with them. Oh before you think meany Shaheeny, let me tell you even though we have a cat in the garden, these are well treated birds, they got proper bird seed. The Beetroot Brazil Nut Roast sliced beautifully. I wish I could show you what it looked like inside, I might still in the next couple of days as mentioned I still have quite a bit to go through. And its actually tasted much nicer than I had expected. 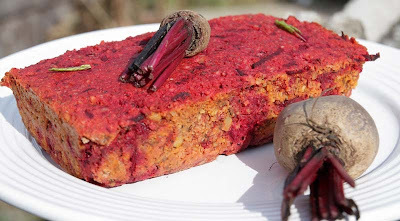 It was a proper nut roast with hints of beetroot. This time round it was served with new potatoes, baby carrots and runner beans, but other seasonal green veg like kale or broccoli would do nicely too. I am sharing this Beetroot Brazil Nut Roast with Four Seasons Food 'Sliding into Autumn' theme. Four Seasons Food hosted by Anneli of Delicieux and Louisa at Chezfoti; and Credit Crunch Munch, a food blogging challenge set by Helen at Fuss Free Flavours and Camilla at Fab Food 4 All. This challenge encourages us to share our frugal food recipes in order to share that good food does not have to cost the earth. This month it is hosted by Elizabeth's Kitchen Diary. Preheat oven to gas mark 4/180oc. Grease and line a 1lb loaf tin with baking parchment paper. In a large bowl, pour in the chopped tomatoes, then add all of the other ingredients and stir well to combine. Spoon the mixture into the loaf tin pressing it down well. Place the tin in the oven and bake for 45 - 50 minutes, or until a knife inserted comes out clean. Remove from the oven and allow to cool. Carefully run a knife around the inside of the tin to loosen it. Turn out carefully onto a serving dish. Slice and enjoy. Thank you sooo much for your lovely comments, means a lot. Now when will I be famous that is the question :) Ha ha just kidding, I hope you try this out, should be ok with walnuts. Thank you so much Anneli, we still have quite a bit which we are enjoying as a snack. Oh it so good to hear from you Hannah. I've loads of beetroot ideas on my blog, just type beetroot int he search bar and you'll hopefully find some more inspiration. Mmm, love a nut roast! 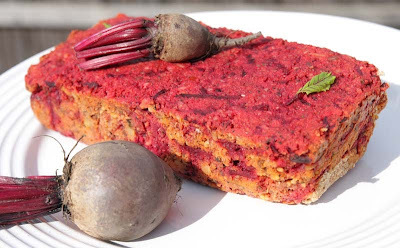 I bet this is something my mum would like to try too, she grows a lot of beetroot on her allotment but usually only eats it in a salad or pickled. Thanks Emily. More nuts roasts to feature as autumn is kicking in. I hope you get your mum to give it a go. What a clever recipe! It looks delicious!!! Thank you for sharing with Credit Crunch Munch! Thank you. I will be making this again.